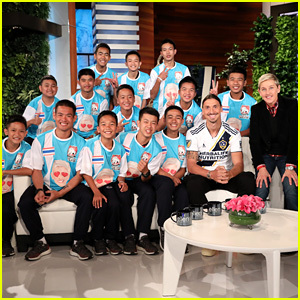 Ellen DeGeneres Talks to Thai Soccer Team in First In-Studio Interview Since Cave Rescue – Watch! The rescued Thai soccer team is speaking out. The Wild Boars soccer team, along with Coach Ake, appeared on The Ellen DeGeneres Show on Monday (October 15). During the appearance, the team recalled their harrowing experience being trapped in a flooded Thai cave for 18 days. They explain how they remained calm and positive with prayer and meditation until their successful rescue. Each individual rescue took around 8 hours, but they don’t remember much since they were sedated, they explained. They also revealed four of their teammates spent their birthdays inside the cave. Later, Ellen surprised the team with Ellen-ized soccer jerseys and international soccer star, LA Galaxy’s Zlatan Ibrahimović, who praises them as the best team in the world. He also gave them LA Galaxy gear and invited them to a private practice with his LA Galaxy teammates at StubHub Center. Plus, Ellen gave the Wild Boars soccer team a VIP experience and tickets to a LAFC game. Next articleHow will Saudi Arabia deal with stock market plunge?